The cheap, plastic hose I use with my bench top power tools was never my favorite. It was inflexible and hard to use. A month ago I decided to upgrade to a proper small tool hose designed for the task. 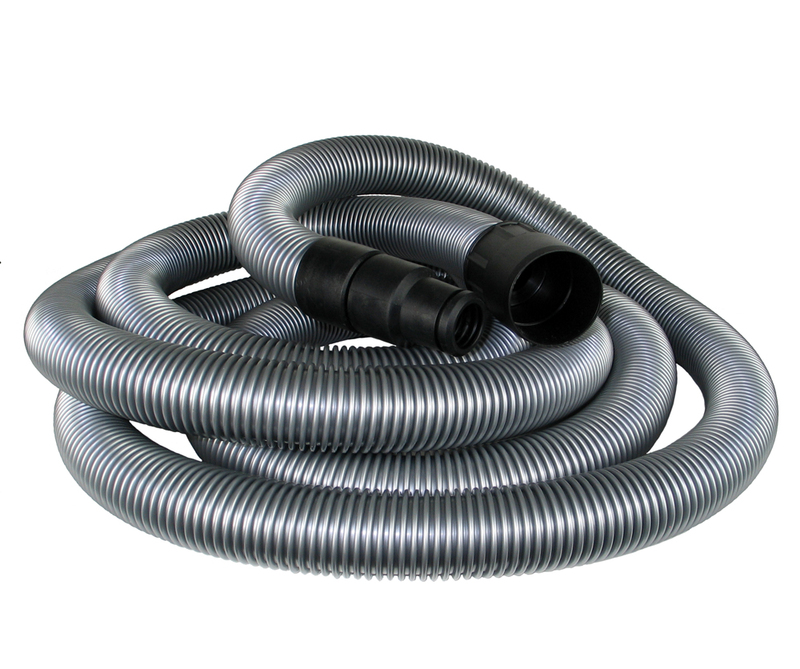 Enter the Bosch VAC005 hose, a economical yet durable solution. Let's take a look at hose well the Bosch VAC005 did in my shop. The Bosch VAC005 is a basic, no thrills hose. No Anti-static property here. The hose has been designed for connection a shop vac to a small power tool. This is a task it will perform day in and day, may that be on the job site or in a shop. The hose itself lies flat on the ground once uncoiled. It can be coiled back up in any direction. The hose has very little memory. When connected to a power tool the hose follows the tool without any problems. It's weight is noticeable, however. For best results the hose should be supported near the tool; say on top of the workbench. Working overhead with most of the hose hanging from the tool can be a chore. The coupler on the tool end uses a two-piece, spinning design. The part connected to the tool is free to rotate relative to the part of the coupler connected to the hose. This eliminates kinks in the hose that happen when the tool is moved around. The coupler is made from rubber to increase friction with the dust port it is connected to. The inside is ribbed to further increase the strength of the connection. Airflow through the hose is excellent. Even large tools like my belt sander had enough air for the dust collection mechanism to work properly. Clogging the hose when it is combined with a moderately powerful shop vac is almost impossible. My vac/hose combo emptied the collection drum of my cyclone in a torture test without clogging. The filter of the shop vac gave out before the hose did. The connection points between the hose and the couplers at both ends are very sturdy. The couplers can be removed, if necessary. The tool end uses a screw type fitting can grabs the ribs of the hose. The shop vac end uses a straight friction fitting. This end is the weaker of the two. I doubt it'll come lose, but should it do so it can be locked down perfectly with a hose clamp. The hose itself is made from plastic. It appears to have been extruded as a continuous unit. There are no seams to be seen. The ends have been cut cleanly without fraying. Should a running tear develop at either end, it can be removed by cutting the hose. The hose does take damage when stepped on. The side walls collapse and the hose folds in on itself. It springs back to almost it's original diameter, but the walls are noticeably damaged. You do need to be careful around the hose, if you want it to last a long time. The hose reacts very well to being tugged. It stretches a bit under stress, but returns to normal length as expected. Pulling the shop vac around with the hose is not a problem. Table legs and other sharp corners are a kink waiting to happen, if you are not careful. The 35mm end is compatible with the Festool product line. The hose end will fit into or over the Festool dust ports just like the Festool hoses do. I did need an adapter for my shop vac, which uses a 2 1/2 port. The Bosch VAC005 is one of those products that deliver solid quality for a reasonable price. The hose is not the most durable, most user friendly, or even best on the market, but it is a very good value. The Bosch VAC005 Vacuum hose performs almost as well as the leaders, and it will last a very long time under most conditions. If you are looking for a solid hose that does not break the bank, the Bosch VAC005 hose will serve you well. It will keep doing so for a very long time. You can't go wrong with this one.